Egypt has launched its own inquiry into whether a bomb may have been placed on the Russian airliner that crashed in Sinai, killing all 224 people on board. A senior Egyptian official - who asked not to be named - told the BBC that every lead was now being followed up. 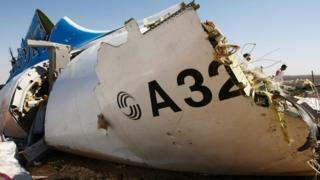 However, Egypt stresses that the official investigation into the crash of the Airbus 321 is not yet finished. Some Western experts have suggested militants in the Sinai peninsula could have bombed the plane on 31 October. Sinai Province, a group affiliated to Islamic State has repeatedly claimed it brought down Metrojet Flight 9268, flying from the Egyptian Red Sea resort of Sharm el-Sheikh to the Russian city of St Petersburg. The UK halted flights to and from Sharm el-Sheikh last Wednesday, citing intelligence concerns. Russia - who initially criticised London's move - later announced it was stopping all flights to Egypt and flying some 80,000 Russian holidaymakers back home. Most of the victims on board the Metrojet airliner were Russian nationals. BBC's Transport Correspondent Richard Westcott: Longer airport queues? We are all used to the liquids ban on planes. And you have probably had to take your shoes off before going through security. Both restrictions came about because of attack plots on airliners. So the big question then. If the Russian plane crash in Sinai was a terror attack, will we see yet more rules put in place before we clear security? And will it mean even longer queues? Could Islamic State have bombed Flight 9268? Meanwhile, Egyptian officials said on Monday that Ashraf Gharabli, a leader of Sinai Province, had died in a shootout in Cairo after security forces tried to arrest him. Western officials say there is a strong possibility that a bomb exploded on the plane, though there has been no indication that Gharabli himself was involved. On Monday, an Egyptian official told the BBC's security correspondent Frank Gardner that the country's intelligence service was looking into every possibility of how someone could have placed a bomb inside the luggage compartment of the plane. The official said this included going through CCTV footage from the airport's baggage area, which had not yet revealed anything suspicious, and questioning employees. Western counter-terrorism experts suspect that jihadists were able to penetrate airport security to target the plane, and there is a belief that Islamic State's affiliate in Sinai may have been able to bribe an airport employee, our correspondent says. But the Egyptian official said foreign airliners at Sharm el-Sheikh airport were never boarded by Egyptian personnel unless requested by the airline. He added that before the crash only 20-30% of airport employees were searched - but that figure had now been raised to 100%, with workers being screened both on entry and exit. Cars were being stopped half-a-mile (1km) from the terminal and checked for any explosive traces, he said, and planes on the runway were being guarded around the clock by a cordon of Egyptian military and security personnel. "We are willing to pay any price to eliminate any repeat of this." the official said. He also added that Britain had still not shared its intelligence with Egypt on the suspected bombing, which was causing considerable tensions between London and Cairo. An Egyptian member of the international team investigating the crash last week told Reuters that they were "90% sure" that a sound heard in the last moments of the recording of the plane's cockpit voice recorder was an explosion caused by a bomb. The plane is believed to have broken up in mid-air. Carries out suicide bombings, shootings, beheadings; dozens of Egyptian soldiers killed. How is a plane crash investigated?